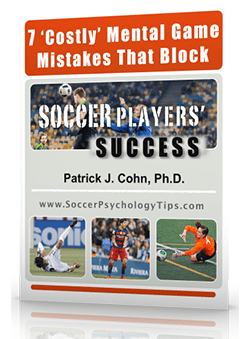 Has an injury kept you off the soccer field for a period of time? Remember a time when you were injured and couldn’t play soccer for a period of time? You may have feared re-injury and held back in practice or played tentatively in games. Injury is an inevitable part of sport. Not only do soccer players experience the physical pain of injury but there also exists strong negative emotions due to the injury. When you are injured and cannot play soccer for a period of time, you may feel like a part of you is missing. The good news is that not all soccer players feel totally devastated after injury. There are some mental factors that greatly influence how you manage your injury; including your response to the injury, your recovery and your return to competition. Dr. Courtney A. Klenk investigated how injury affects athletes in her research, “Psychological Response to Injury, Recovery, and Social Support: A Survey of Athletes at an NCAA Division I University” (2006). Klenk noted that negative emotions experienced as a result of injury can influence the athlete’s attitude toward and subsequent recovery from injury. Klenk stated when an athlete experiences a high level of anxiety due to an injury, there is a greater potential for re-injury than athletes who are less stressed. Athletes who are reluctant to let an injury alter their goals or prevent them from fulfilling their aspirations respond better to injuries. Athletes who talked to other athletes who had successfully recovered from their injuries helped keep them positive throughout recovery. Klenk concluded that it is just as important to attack an injury from mental perspective as it as from the physical angle. Tip #2: Find support from coaches, athletes and mental training coaches on how to stay positive throughout the injury process. Talk to other athletes about how they handled injury and returned to the game of soccer even better than before their injury. 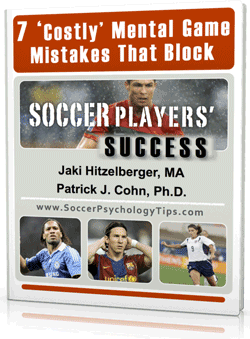 Successful soccer players have learned how to perform with ultimate confidence in competition. 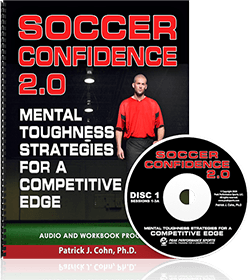 We’ve developed Soccer Confidence, a Workbook and CD program to help you do this.